Find It Hard to Sound American? Take Some Water in Your Mouth! Recently I wrote an article about Americans speaking as if they’re holding a hot potato in their mouth. I’m sure you’ve heard such or a similar description of the way American English sounds, and I have to tell you that it actually holds water! To prove my point, I’m going to take this idiom literally and see if the American English can indeed hold water (as you may have guessed by the headline, I’m going to speak while holding water in my mouth)! 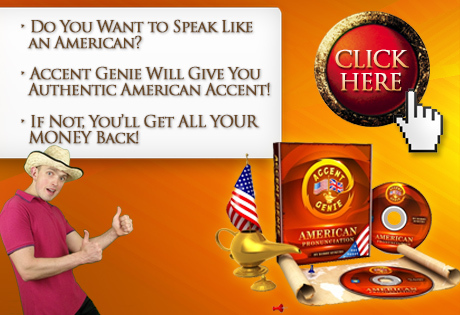 At the same time, I’m going to show you the EASIEST way of getting the feel of the American accent if you’ve found it difficult in the past. Robby, You Gotta Be Kidding Me! Sounding American Is About So Much More Than Just That! Well, I’m not saying you can master the General American Pronunciation within a matter of a heartbeat. I’m performing this act just to illustrate HOW TO GET THE OVERALL UNDERSTANDING of how your MOUTH has to be POSITIONED! I also understand that I’m not in a position to teach you the subtleties of the General American Pronunciation because I’m only learning it myself, but I believe that I’ve gotten the basics right – including the mouth position – in order to sound American. The basic characteristics of the American pronunciation is this deep, resonating sound which is created right inside of your mouth, and to achieve that, your cheeks need to be slightly ‘inflated’. The problem is, many of my fellow foreign English speakers trying to learn the American accent find it difficult to position their mouth properly, and it might take them a lot of time till they figure it out going the trial and error way. Exaggeration Is the Perfect Starting Point! I personally find that it’s very easy to get the general idea of an accent if you exaggerate certain facial features characteristic to the people speaking with that particular accent. If you’re struggling to get your American accent going, all you have to do is pull the corners of your lips back in a mock smile, and it will force you to create American-like sounds even if you speak English with your own native accent. And of course, I don’t advise such an approach for lengthy American English practicing sessions; it’s just to get the general feel of the accent! Here’s a practical application of this method, and you may want to do the same when practicing your American English. Speak with your mouth wide open, lip corners drawn back, and then slowly do away with the funny face and eventually adopt a normal facial expression WHILE at the same time retaining just a little bit of that crazy face. I personally find that if you keep the corners of your mouth a little bit drawn back, it helps you with not slipping back into your normal foreign English accent. So, let me know what you think about it, and I would also like to hear if you find my little piece of advice of any help to you! It’s very good your pronunciation an American accent so it’s take some time to learn it , but I know some american pronunciation and how to speak a Little bit, because I was studied American English in American language center in Abu Dhabi before 5 months ago only one month and half but expensive it cost 2000Ad per month. You are so right with the ‘lips corners draw back’! I learnt American accent by repeating actresses and actors lines, in practice copying faces and emotions in their voices. And one day, it suddenly hit me they were drawing their lip corners back. I thought I was extrapolating, but your article proved my observation. You wrote you moved to Ireland a few years ago, so if I may ask where you are from. Is there any chance you’re from Spain, or maybe you had any contact with Spanish? I’m interested in it, because you seem to have extremely detailed knowledge about English and you got, at least some of it, from intuition/subconsciousness/instinct/observation/practice/gut* (choose the right one). You’re the only one who noticed the ‘lip-corner’ thing and I’d really love to get that kind of advice concerning Spanish. And it’s not anywhere I could find it. Sorry for getting back to you with such a delay, I missed you comment somehow! Speaking of the ‘lip corners drawn back’ thing – you’re right, this piece of advice can’t be really found anywhere else, and it’s my personal observation because I’ve been practicing my English so much over the years. We seem to be on the same wavelength on this, and I would love to see your progress with the American Pronunciation – any chance you could record a video or smth? It’s true that exaggeration is a good way of learning another accent. As a matter of fact, when people are tipsy they tend to imitate a foreign accent better because they lose their inhibitions. Robby, this video is amusing. It helps to get a feel of American accent, but somehow it sounds like a rural accent. Well, it does, but most importantly – it does provide the general notion of how sounds must be produced when speaking American! Previous post: Why Americans Speak With a Hot Potato in Their Mouth & How It Can Benefit You!